Ozomatli is a Los Angeles-based, world music collective that is as difficult to pigeonhole as it is easy to enjoy. Does the ten-member (sometimes more, sometimes less) group play funky dance music? Hip-hop? Mariachi? Spanish rock? Samba? American pop? Based upon the wide variety of content contained on its fourth release Live at the Fillmore, the band seems to do everything quite well as it delivers its multi-cultural gumbo of ideas. Indeed, Ozomatli is a veritable melting pot of ethnicity — Hispanic singers trade vocals with African rappers, while a Caucasian DJ scratches behind a rainbow coalition of horns and percussionists. The group is what America should be, and the music performed by these multi-instrumentalists is tight, flawless, and intoxicating. Pairing a concert album with a bonus DVD, Live at the Fillmore opens with the scratching of the turntables by DJ Spinobi before the band launches into Dos Cosas Ciertas, where traditional Spanish vocals segue into urban hip-hop. Fans of the Latin-tinged rock of Santana and Los Lonely Boys will fall in love with (Who Discovered) America and the beautiful Cuando Canto, while devotees of straightforward, party-style hip-hop will enjoy Saturday Night. Other standout tracks include the jazzy samba-flavor of Eva and the ultra-catchy, mainstream pop of Love and Hope. The only time the band overstays its welcome is on the CD’s finale La Misma Canción, where an overly lengthy call-and-response jam with the crowd fails to translate its potency to a home theater setting. For the past seven years, Ozomatli’s impressive studio albums consistently have been eclipsed by tales of the band’s legendary, high-energy, booty-shaking concerts. Its rabid fan base, which is displayed prominently on the generous 14-song concert DVD included in this package, is a dancing, smiling throng that offers a reflection of the party that is happening on stage. 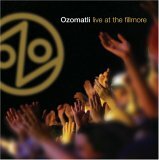 For newcomers to the fiesta, Live at the Fillmore’s CD-DVD set is a sparkling initiation to the cultural breadth and musical quality that Ozomatli represents.